A veterinary technician is considered to be a nurse in animal healthcare, but we play an even broader role than that of a human medicine nurse. We have either a 2 or 4 year college degree in veterinary technology and we are the veterinarian's surgical nurse, anesthetist, laboratory technician, radiography technician and dental technician. We work directly with you, communicating patient health, providing education and taking diagnostics. 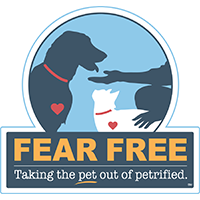 Basically, we do anything that the patient, you and the veterinarian needs or assigns. 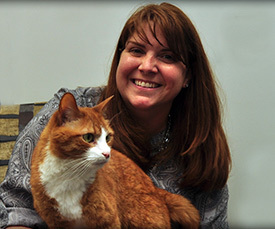 I have been working at Kingsbrook Animal Hospital since July of 2000. I was fortunate enough to find a position here shortly after graduating from a 2 year veterinary technology program. I feel very fortunate to work in an environment where I feel valued and useful. I am also very fortunate to work with such a dedicated group of people who share my vision and goals for providing quality service and care to our patients. It has allowed me to maintain an enthusiasm for my profession that I consider a gift. I enjoy spending my free time with my family and friends doing anything outdoors. Some of my favorite pass times are hiking and kayaking. I aspire to one day live in a tiny house! I joined the KAH crew in August of 2004. Originally from Ohio, I moved here where I now live with my family after graduating from tech school. 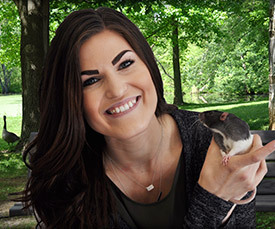 I received my Bachelor of Science degree in biology at Marietta College in Ohio, but I found my true calling after working as a veterinary assistant in a small animal hospital. It was then that I decided that I wanted to be a veterinary technician. I attended Columbus State Community College in Columbus, Ohio for 2 years to receive my license. Part of my training included working with students at The Ohio State University who were studying to become doctors of veterinary medicine. I also had the pleasure of spending 5 weeks at the Ohio State Chimp Center, which was an awesome experience. I was lucky enough to be there at a time when the 2 youngest chimps, Emma & Harper, were small enough that we could interact with them. I spent many days with them in their playroom – chimpsitting. I also got to meet Keely and Ivy, who have been on the Discovery Channel. I enjoy spending my free time playing with my family and laughing with my friends. I grew up in Pennsylvania and received a Bachelor’s degree in Communications from Shippensburg University in 2003. In my last year of college, I hand raised a litter of orphaned kittens. From then on, I was hooked! I kept one of the kittens and named him Calvin. I loved caring for him so much that a year and a half after graduation, I decided to pursue my love of animals and enrolled at Wilson College in Chambersburg, PA. While at Wilson, I fell in love with sighthounds. When I saw Stewart, a white and brindle Whippet, it was love at first "sight". He quickly became my best friend and heart dog and we were able to spend 11 years together. Also during my time at Wilson, I was fortunate enough to intern here at Kingsbrook! 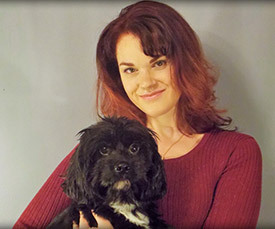 I graduated in 2008 with a Bachelor’s degree in Veterinary Medical Technology. Throughout college, I worked at a mixed animal practice in Shippensburg, PA followed by a small animal practice in Gettysburg, PA until I re-joined the Kingsbrook Team. I have Buckley, a Galgo (Spanish Greyhound), Burley, a Bernese Mountain dog, Sasha Fierce and Sullivan, whippet mixes, and cats- BenjaminFranklin (all one word) and Rhonda. They are all rescues! I am very fortunate to have found my way back to such a progressive hospital with a compassionate and hardworking team. I have always had a love for all creatures and always knew I wanted to work with animals for as long as I can remember. I’m a military brat and have lived all over the world. I started officially working with animals in Yokosuka, Japan in 1998 where I volunteered as the Vice President of the local animal shelter and assisted local veterinarians at the Veterinary Treatment Facility. I truly love my job, and live for what I do. I’ve taken a special interest in diagnostic imaging, pain management, and rehabilitation. I’m also a certified canine massage therapist. I currently have 3 dogs, Ethel, Hubert, and Barrett. Ethel is a Chihuahua/Dachshund mix, Hubert is a boxer, and Barrett is a labrador. I also have 4 cats (Carlisle, Pismo, Eliza, and Lil), a bunch of chickens, 3 goats (Charlotte, Heidi, and Gretchen), a bunny (BunBun), and 2 mice (Agnes & Oblina). 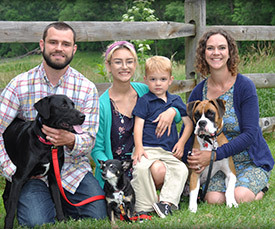 In addition to my lovely pets, I currently live with my husband, two daughters, and son (Sean, Monika, Bronson, & Kynlee), who share the same love for animals as I do. In my free time I enjoy spending time outdoors: camping, hiking, bird watching, gardening and scuba diving. I love spending time with my family and friends. I joined the Kingsbrook team in August of 2011 and feel very fortunate to be here. I’m proud to be a part of such a loving, compassionate group and look forward to years to come. I have been working in the animal field since I was 17 years old. I grew up loving animals (especially dogs and cats) and knew that I wanted to work with them as a career. Growing up, I came from a family that always had at least one cat in the house. I have also owned a mixed breed dog in the past. I hold a special place in my heart for rescues and geriatric pets. I graduated from Penn Foster College with an Associate Degree in Animal Science in 2010. 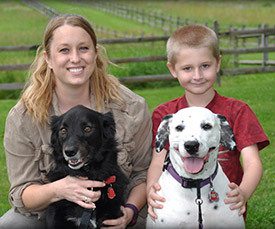 In the beginning of 2011, I became a Registered Veterinary Technician in the state of Maryland. I have previously worked as a kennel attendant/receptionist, grooming assistant and veterinary assistant before becoming registered. 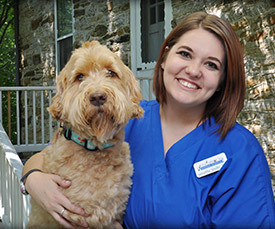 I started working at Kingsbrook Animal Hospital in July 2013. I love how the doctors and staff at KAH truly care about the animals and want what is best for them and their owners. I feel fortunate to be part of the team and I am lucky enough to call my coworkers my friends. I am continuing to learn from everyone here daily, and I want to strive to be the best technician that I can be. I currently live in Frederick, MD with my senior rescue cat, Beemer. From a young age, I have always known that I wanted a career in the veterinary field. Growing up, I convinced my parents to adopt several stray cats that were wandering our neighborhood. I got my first horse when I was 10, and worked to foster, rehabilitate, and rehome over a dozen horses rescued from slaughter pens during my teenage years, until I adopted a wild Mustang mare and foal from the Bureau of Land Management. During and after high school, I worked in a small animal clinic in Hagerstown and then worked for the Humane Society of Washington County, where I also fostered countless animals. Since graduating from Wilson College in 2014, I have been blessed to work with such a compassionate and progressive hospital. I look forward to many more years to come. Currently, I live in Martinsburg, WV with my husband, Jason, and our boys: Nick, Gage, and Tristan. We are privileged to share our home with our our dogs: Madeline and Surge, our cats: Esme and Johnny Blaze; and my Mustang, Dancer, and occasional stray "foster" kittens from our neighborhood. In my free time I enjoy spending time with my family, hiking with our dogs, and riding. For as long as I can remember, I have wanted to work in veterinary medicine. My dream finally came true when I was accepted into Wilson College during my sophomore year of high school. In May of 2014, I graduated from Wilson College with a bachelor's degree in Veterinary Technology and a minor in Small Business Management. Right after my graduation, I joined the team at Kingsbrook Animal Hospital. 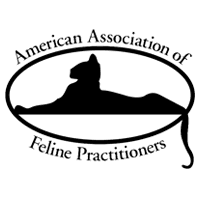 In November of 2014, I took my Veterinary Technician National Exam and became a registered veterinary technician! Every day is a different adventure and my teammates (and friends!) have helped me grow and become a better technician and human. I have a special interest in exotic veterinary medicine, especially after the losses of my boys Roderick and Hawke (my guinea pigs). Currently, I live in Hagerstown with my boyfriend, Joey, our mixed pup Emmalyn, cat Oakley, Speckled Kingsnake Benedict, and Chinese water dragon, Spyro. In my free time, I enjoy photography, crochet, craft projects, hiking, camping and really anything that gets me outside! Ever since I was little I've had a love and curiosity for all animals. I was more of a tom-boy so I had frogs and lizards and I was always picking things up outside and trying to convince my mom to keep everything I found. My first job, at 13 years old, was working at a kennel, walking dogs and cleaning. I loved it! I later started working at a veterinary hospital near my home when I was a Junior in high school and I have been working in the veterinary field ever since. I was fortunate enough to travel to Africa for three months in 2011 on a humanitarian mission. It opened my eyes to many things. Of course I was trying to feed and pet all of the stray cats and dogs, but I was able to experience a lot of Africa's nature, which varies greatly from Pennsylvania and Maryland. I knew when I was there that when I got home I would apply to college to pursue my dream of working with animals. I graduated from Wilson College in May of 2016 with a BS degree in Veterinary Medical Technology. I passed my board exams in July 2016 and am a registered veterinary technician. I've been a part of the Kingsbrook family since October of 2014. At Kingsbrook, I am fortunate enough to work with so many awesome people who share the same passion and goals as I do. I currently reside in Gettysburg Pa with my husband, along with our two rats, Feta and Curd, our cat, Brie, and our Basset hound/Pitbull mix, Bleu. I enjoy spending my time with my family and friends. And when I'm not working you can find me enjoying the outdoors, traveling, or riding my motorcycle! I spent much of my childhood in the creeks and streams of Georgia, searching for critters with a dog at my side. 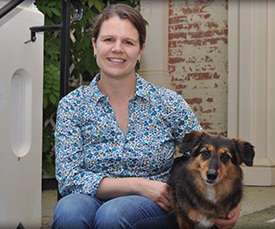 It wasn't until after receiving my undergraduate degree and working for several years that I realized I wanted to make working with animals my career. I took it upon myself to go back to school and acquire a degree from the Vet Tech Institute in Pittsburgh. While earning my degree, I also worked for a mobile veterinary clinic that roamed the countryside of Western Pennsylvania. Upon my return to Maryland in January 2016, I was lucky enough to intern at Kingsbrook, where I continue to work, learn, and do my part to keep animals safe in our human world. In my spare time I like to read, watch movies, and go on adventures with my young pup Wallace. I love to get outdoors, swim, and play board games. My humble home can be found in Kensington, MD. When I was eight years old, I was certain that I wanted to be a veterinarian. 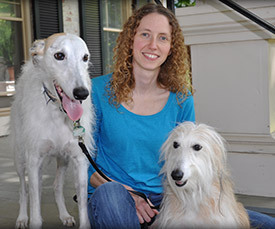 My family did a lot of work with rescuing retired racing greyhounds, so I got to spend a lot of time in veterinary clinics growing up. As soon as I was able, I started working for an animal hospital as a kennel technician. I was also fortunate enough to be able to begin learning the medical side of the practice, too, by helping with appointments and lab work. 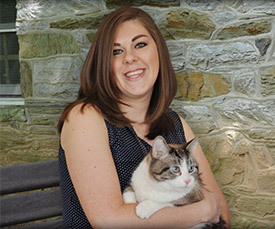 I attended Harford Technical High School, and graduated in 2003 as a certified Veterinary Assistant. I then majored in Biology, with a minor in Business Administration, at Elizabethtown College in Pennsylvania. In 2007, I graduated from college and applied to veterinary school. After a few years without success, I realized veterinary school wasn't my dream anymore--but I knew I wanted to continue working with animals. After some soul searching, I decided to become a veterinary technician. I came back into the field in 2012, following several jobs in retail and in sales. I graduated from Penn Foster College's Veterinary Technology program in September 2017, and obtained my license in 2018. Besides animals, I love reading, playing board games, and scrapbooking. I live here in Frederick with my dog Jacoby, my cats Widget & Dracula, and my wife Angela. 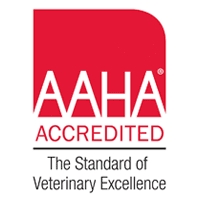 I am originally from Michigan, which is where I attended a 2-year program to become a Licensed Veterinary Technician. Before that, I was actually taking courses toward a computer science degree, but my heart was always leaning toward working with animals. So here I am! I currently live with my boyfriend, Eric, and our 4 wonderful cats Butternut Squash (ButtButt), Cinnamon Swirl (Cinnabunz), Mariah (MoMo) and our newest addition Olive (Lollie Pop). My journey as a L.V.T. before joining the team at Kingsbrook was a long, but exciting one. I started in routine practice for a few years as a veterinary assistant while I was in school and then I had moved on to emergency and critical care working overnights and 60+ hour weeks. 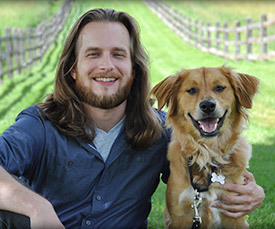 After a year of ECC medicine, Eric found a job at Best Friends Animal Sanctuary in Southern Utah, and I followed suit! Working at Best Friends was a dream come true. 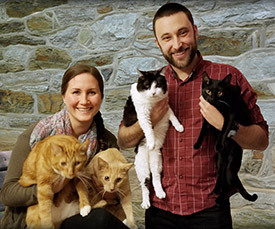 I worked in their Cat World department and getting to know all the people and all of the animals was extremely rewarding. Aside from the Sanctuary, the scenery was stunning and we were only about 45 minutes from a few of the most popular National Parks in the country. We could actually see the North Rim of the Grand Canyon from our little home, which was an hour and a half drive away! After a little over a year spent there, we decided we wanted to move again to be closer to family. Accepting this job here at KAH was an easy decision after I met the team, and an even easier one when one of our cats got really sick and had to come in for an exam and diagnostics. The care and compassion that not only Eric and I received, but our sweet fur-baby received as well, was absolutely unparalleled. I am looking forward to my future here at KAH as a part of this wonderfully compassionate team, and am excited to get to know more about you and your fur babies!